For the last several years, I’ve been on a quest. A quest that has finally been completed. I can’t remember exactly when it first started, but I remember a happy time. I owned a modded Xbox (the original!) and it had a media player installed on it. It was called XBMC which aptly stood for XBox Media Center. It was an absolute delight to use. My gaming machine became my lounge room media player. It connected to my TV via S-Video as that was slightly higher quality than Composite video, it had a 100mbit Ethernet port so I could steam media from a PC in another room. It supported SMB file shares which meant no client was required on my Microsoft Windows PC, it just had credentials to navigate through folders and play the videos I wanted. The navigation of the software itself was quick and smooth. I could quickly jump to any point on a video, or fast forward and rewind with ease. I could even easily adjust the sync of the audio and video if my source was out of sync. There was even an official Xbox Remote and IR Sensor that worked brilliantly with the setup, so no death trap cable was running across the living room (unlike the network cable, but that’s another story). This delightful time ended eventually. Higher resolution TVs came out with their fancy new standard connection – HDMI. The Xbox was cast to the side, as a full tower PC took it’s place. Windows Explorer along with a keyboard and mouse was the easiest thing to use to navigate and play files. A VGA cable simply connected the PC to the new TV and supported 1920 x 1080. Sure, lots of the media I actually watched was still nowhere near that resolution, but there was no other decent solution at the time. As flexible as a PC is, I wanted something that required less maintenance. I didn’t want to worry about finding the right codecs, or having special cards to output video and audio in different ways based on what TV and sound-system I had. I wanted a native remote to the device, and not sit there mapping out buttons for each function I wanted it to perform. With that in mind, I patiently waited for something better to emerge. Fast forward a few years and all-in-one media players finally started to emerge. My first experience was a device I can not recall the model or even brand of, but it required the media to be on a local USB stick. It worked mostly, but was still a pain to copy stuff around constantly. It was at this stage, I decided I really needed another XBMC. How hard could that be? Late 2009, I obtained a Western Digital WDTV Live for around $100 which was half price of the RRP. It seemed to fit the bill – A remote control. 100mbit Ethernet and able to read from SMB shares. HDMI. Support for pretty much any video format out there… and it was good. Smooth navigation of the interface, it was nice to use. Still no XBMC experience, but I accepted it as being good enough. It did last a few years, but eventually technology overtook the device again. Western Digital stopped updating the WDTV Live, and newer media formats came out. Newer Operating Systems also came out, which started to cause random issues with being able to see the network at all. I wasn’t the only person experiencing this, many others were too but none of the recommended fixes helped. Rebooting all devices on the network several times eventually kick-started the WDTV Live again, until it was rebooted. Frustrated, it was time to go back to searching for the XBMC replacement. I’d kept my eye out looking for a $200 or less device that again fit my requirements, but didn’t find anything suitable for a year or so until Android Media Players started to become popular. Being in Australia, there weren’t any local options for a while until I spotted the Kaiser Bass Smart Media Player which was stocked at a local retail chain. It ticked off the requirements on the phyiscal side of the device, but it was woeful to use to the point of completely unusable. You can read my review on the link above for the full story, but it was really surprising to have such a poor experience with a store-bought product. Without a different local Android based Media Player to try, I found a second hand Raspberry Pi Model B for sale which was already in a case, IR sensor attached with media remote, and an SD card for $100. It also had Raspbmc installed, which is a linux distribution with XBMC designed for the Raspberry Pi. Others I spoke to had set up the same and claimed it was a great media player. It sounded perfect! Except that it wasn’t. It was decent, but not great. Controlling it was slow and laggy – from just navigating around the menus, to playing a video and trying to do basic fast forwarding and rewinding. I put up with it for a week after reinstalling Raspbmc from scratch and hoping it’d get better but it never did. It’s not bad for the price, but the old WDTV Live did a much better job overall. I was giving up hope again, but someone told me about the Intel NUC. I’d heard about this before – it was a tiny PC, but not a very cheap one. Since then though, a newer generation of the NUC had been released which had two important additions: support for 2.5″ HDDs (compared to the original expensive mSSD or external USB stick only options) and an IR sensor on the front. It ticked all those other boxes I expected too (apart from coming with a remote, but I already had one from the Raspberry Pi to use), so I started to get hopeful again. 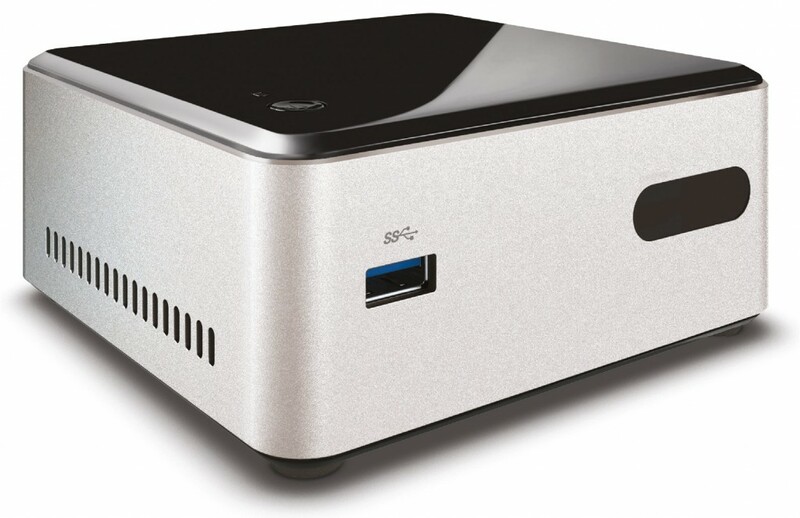 They’d also dropped in price, so the entry level Celeron NUC was around the magical $200 mark. Even better, there seemed to be official XBMC support for it! I reluctantly ordered one, while being less than optimistic about the upcoming experience. The Intel NUC arrived, and I thought I’d get away with using a spare laptop sized 4GB DDR3 stick, but soon found out it didn’t work at all due to the NUC requiring 1.35v rated RAM, which I only had 1.5v. Another $50 later I had the correct RAM, and had a spare SSD to install. The device powered up with a clean looking ‘Intel NUC’ logo, so I proceeded with the install. Windows 8.1 was installed onto the device quickly, followed by the latest version of XBMC. I found a utility called XBMCLauncher which made some small changes so XBMC auto loaded when the device came on, and much quicker than I thought the box was ready to go. This time, I was impressed. Menus were able to be navigated smoothly. Videos started up instantly, and rewinding or fast forwarding just seemed to work. It flawlessly played 720p MKV files which nothing else so far seemed to be able to do consistently. I was getting excited. As mentioned earlier, I had recycled the remote from the Raspberry Pi project. That was in use for a few days, until I discovered that using a smartphone or tablet with the Android Official XBMC Remote or the Windows Phone xbmc remote free was an even better experience than using a IR driven remote, so started zooming around the menus even faster. I could even view my indexed TV shows and movies, and jump straight to them to play. After a week of this, I was sold. This was actually better than my original XBMC experience due to the amazing smartphone driven remote. I couldn’t fault it, so my quest was finally accomplished. I still find it amazing that I took so many years to get back to where I was with the original Xbox which wasn’t even designed to be a media player. I own a new Xbox One which can barely stream from a DLNA enabled device (it works as long as you trigger it from the other device, you can’t use the Xbox One itself to do anything apart from receive the media content!). It wasn’t exactly the all-in-one device I thought I wanted, but installation was simple enough and without issue that I don’t mind that. It works, and it works perfectly.